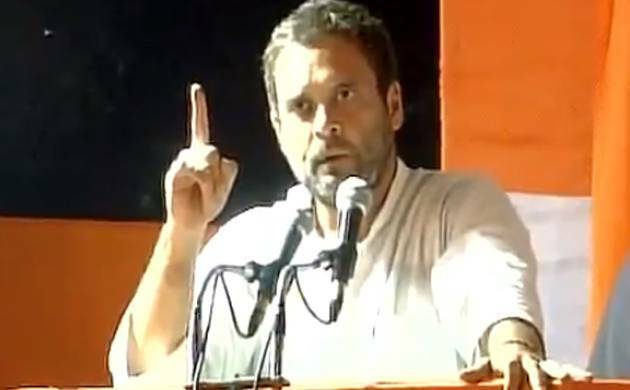 Rahul Gandhi, on Thursday, accused Prime Minister Narendra Modi of indulging in political exploitation of the sacrifices of soldiers in remarks that come in the wake of cross-LoC surgical strikes on terror launch pads in PoK. Congress vice president Rahul Gandhi, on Thursday, accused Prime Minister Narendra Modi of indulging in political exploitation of the sacrifices of soldiers in remarks that come in the wake of cross-LoC surgical strikes on terror launch pads in PoK. “Jo hamare jawan hain jinhone apna khoon diya hai, Jammu and Kashmir mein khoon diya hai, jinhone Hindustan ke liye surgical strike kiye hain, unke khoon ke peeche aap chhupe hain. Unki aap dalali kar rahe ho. Yeh bilkul galat hai. You (Modi) are hiding behind the blood of soldiers in Jammu and Kashmir and those who carried out the surgical strikes for India. You are exploiting their sacrifices, which is very wrong,” he said. Gandhi was addressing a rally in the national capital, marking the culmination of his month-long ‘Deoria to Delhi kisan yatra’ in poll-bound Uttar Pradesh. “The Indian army has done its job for the country, you do yours,” the Congress Vice President said, attacking Modi. His attack comes a few days after he had praised Modi for his first Prime Minister-like action in two years in the context of surgical strikes. Besides, he also accused Modi of making false promises to the people of the country. “Modi ji promised bank accounts to everyone, but there is no money in those accounts. All his promises were fake,” said Gandhi. Lashing out at Modi government, he said only the Prime Minister and his friends were “happy” as money has come into the pockets of 15 top businessmen and not the farmers, labour and small shopkeepers.